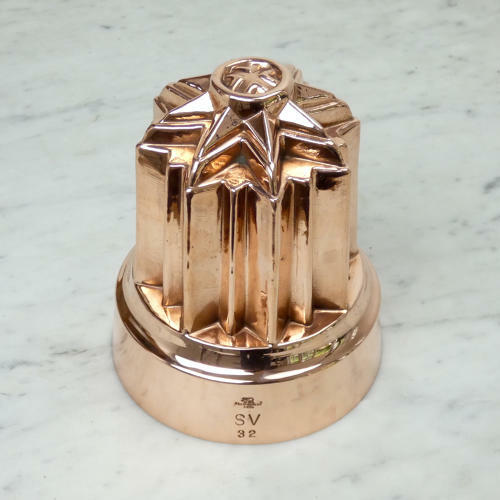 A large copper mould with a star design to the top. This design is known as the Brunswick Star and was originally produced by Benhams in the 1860’s. This example is marked ‘BRIGHTON LTD ’ beneath a lion. Under this is ’S V’ the ’32’. This is actually the mark of an American company who were producing these moulds in the 1970’s and 1980’s. We would not usually buy a mould of this late period but this one is a good mould to use as the tinning is so clean and bright and the design is very crisp. There are two small holes pierced in the rim of the mould. These would not stop it from being used as you do not need to fill it up to that point.